It's an annual dance that's "...instrumental in helping young people who have kidney disease get to know each other..." You can donate a dress or give support. Sometimes the very best parties in this world, the celebrations with the biggest hearts and the coolest people and snazziest decorations, are part of a larger and loving community effort, one in which we can all play a dedicated part. And one of those snazzy celebrations, a buoyant bash full of amazing young people, is ready for its 19th year at the Glendale Hilton on Sunday, Jan. 14. 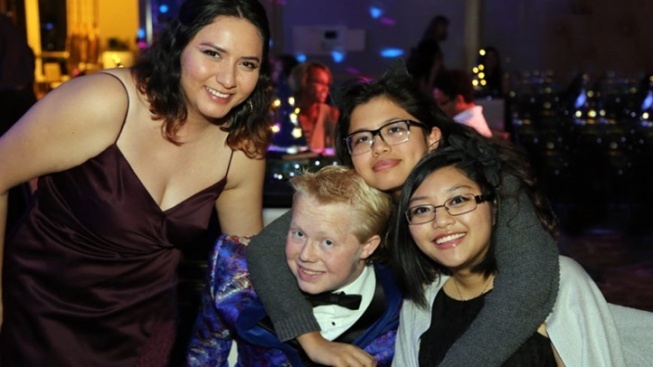 It's the Renal Tree Prom, an annual event that "...is instrumental in helping young people who have kidney disease get to know each other, support each other, and make an empowered transition to young adulthood in spite of chronic illness." Founder Lori Hartwell missed her own prom, and other teen-time activities, due to dialysis and hospital visits. Not wanting other young people living with kidney disease to miss out on the iconic experience, Ms. Hartwell created the Renal Teen Prom as a celebratory and joyful way to savor an adolescent milestone. And that milestone isn't restricted to teenagers who might be deemed as part of prom's traditional age group, say, around 16 or 17. Young people from the ages of 12 to 24 are welcome at the event, which includes a photo booth, dancing, bites, and a now-traditional appearance by actor Jack Black, a long-time supporter of the prom. Attending the Renal Teen Prom? "(Y)oung people who have been diagnosed with a kidney disease, who are on dialysis or who have a kidney transplant." Music, a theme ("Calypso" in 2018), and other details fill out the festivity, all to make for a marvelous night of connection and come-together fun. So how can you help this wonderful gathering? There are a couple of ways, including making a financial contribution to the Renal Support Network. A $50 donation will help a young person attend a future prom. Also? If you have a "gently used" prom dress or tuxedo or other formal outfit, you can donate it to the event. New formal wear is also gratefully accepted, too. Contact the organizers to see how you might drop the dress or clothing off for the 2019 event (as the fittings for 2018 are now complete).